Once you’ve roasted the beets this is simple. Drizzle on extra-virgin olive oil and balsamic vinegar, sprinkle with salt, and serve. 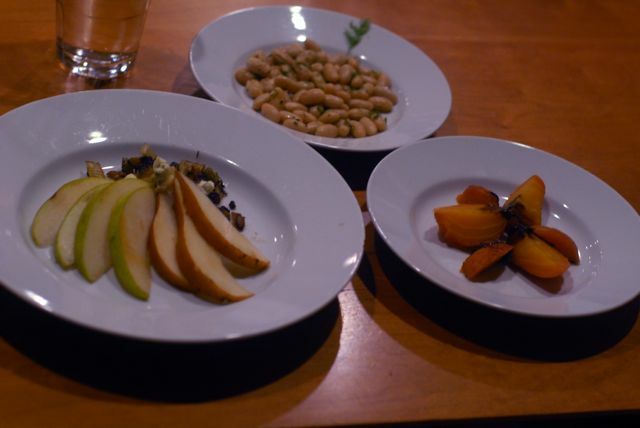 This would be a good dish to showcase any special ingredients you may have like kosher salt or a peppery bright green olive oil. An aged balsamic vinegar helps, too. I’m not suggesting artisan balsamic vinegar, which I’ve never had, though if you have the budget go for it. I use Trader Joe’s balsamic vinegar or the Costco Kirkland brand. 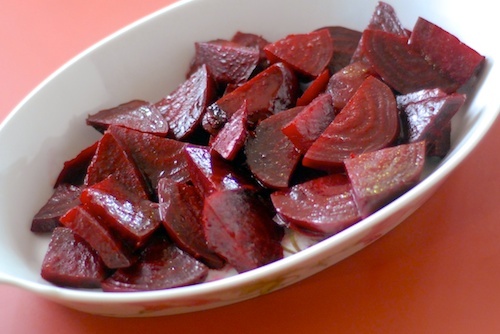 See my previous post for a detailed step-by-step guide on how to roast beets. A simple but satisfying dish: roasted beets with extra-virgin olive oil, balsamic vinegar, and salt. If you have any special ingredients like kosher or sea salt or a peppery olive oil, this would be a good place to use them. Aged balsamic vinegar would be nice, too--- not the break the bank kind, but the $10 a bottle instead of $2 a bottle kind. To roast beets, start by trimming the greens, leaving 1" of stem on top. Make an aluminum foil roasting packet by folding aluminum foil over about three medium beets at a time. Or place the beets in an ovenproof stockpot and place the lid on the stockpot. Place the foil packet or the stockpot in a 375 degree oven. Roast for one hour, then check the beets with a fork. They are done when the fork goes easily into the middle of the beet. After one hour, check the beets every 15 minutes until they are done. They will probably take between one and one and half hours, unless they are extremely large. To skin the beets, either protect your hands using gloves or a paper towel or cloth, or accept that you will need to scrub the pink off your hands afterward. The skin will rub easily off the beets. 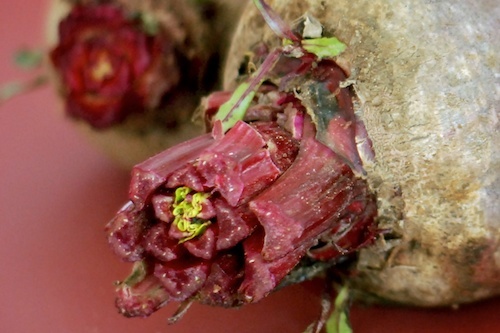 To serve beets: Slice each beet in half, then into ½ " thick rounds. If the beets are especially large, you may want to cut them into quarters. Drizzle olive oil over the beets, then balsamic vinegar, then sprinkle with salt. 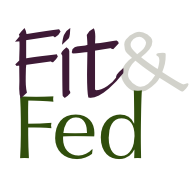 Healthy Holidays: Dinner Fail-Safes Does someone in your house support your efforts to cook healthy? What are your fail-safes for getting meals on? Can you build in some extra ones for when things go wrong? 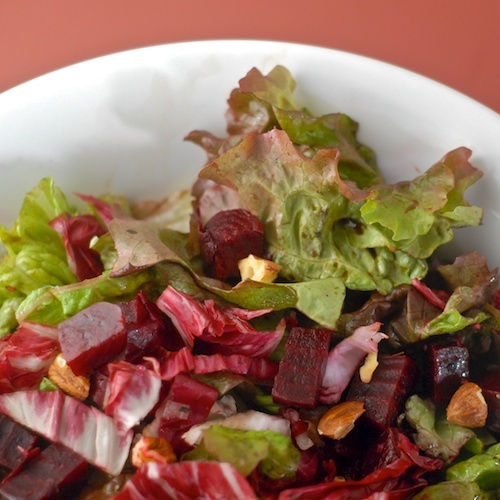 Bibb, Roasted Beet, and Radicchio Salad with Hazelnuts A beautiful pink, red, and green salad with sweet roasted beets, radicchio, and hazelnuts with Bibb and red leaf lettuce. I'll show you how to make the radicchio mild, not bitter. As soon as the beets come out of the oven I hold them under running cold water and rub the skins off. The running water keeps the beets from burning your hands and you won’t have red “beet fingers”. Good idea Herb! Thanks for leaving a comment for others to learn from. I will have to try it that way myself next time!